And then there is my nostalgic and childhood video game movies like ‘Super Mario Bros.‘ (my first date), ‘Mortal Kombat‘, ‘Street Fighter‘, and ‘Double Dragon‘. Now while I love these films for my own personal reasons, as they each hold a special sentiment and time in my young life, these films do NOT hold up by any means, and are straight laughable. My point is that there really hasn’t been a good video game movie. That is until now with ‘Need For Speed‘ from director Scott Waugh. Waugh, who was a big-time stuntman in Hollywood until he directed the Navy SEAL film ‘Act of Valor‘, has rounded out a fun cast led by the amazing Aaron Paul (‘Breaking Bad‘), and has given us a thrilling and highly entertaining video game adaptation of a suspenseful car chase and race movie. You might want to compare ‘Need for Speed‘ to any of the ‘Fast and Furious‘ films, but I say they are very different films. First off, ‘Need For Speed‘ uses no CGI, but rather practical physical effects, just like they did in the old days with ‘Dirty Mary,Crazy Larry‘ and ‘Vanishing Point‘. The results are phenomenal, as everything looks real and not over-the-top like when Vin Diesel jumps out of a car going 150mph into another car across a 200 foot bridge without missing a beat. This movie doesn’t have moments like that. instead we get real thrilling situations that could more or less happen, which makes for a better in film in my opinion. We focus on Tobey Marshall (Paul), who owns a car repair shop and has top notch skills for racing. 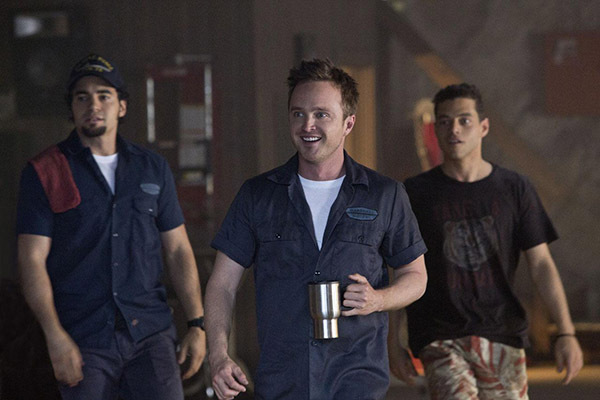 A former friend named Dino Brewster (Dominic Cooper), shows up at the garage and offers to race Marshall for money. Marshall is in dire need of money to keep his business alive so he accepts this offer. The race begins with several people in fancy foreign cars across the streets of anywhere USA. Dino doesn’t want to lose at anything and ends up causing a crash that kills one of Marshall’s best friends, to which Dino frames Marshall as the culprit. After Marshall spends a few years in jail, he is released with revenge on his mind in the form of a mysterious annual race headed up by a man known as Monarch (Michael Keaton). This race is very secretive and has people from all over the country trying to get a spot in the race, which is unknown to everybody up until 48 hours before the race starts. When the races find out where the race is, they must make it with their car to the check in point with in two days. The prize is that the winner gets every entrant’s vehicle, plus bragging rights. Well of course Dino, who is now a wealthy businessman in the car industry, but is as sinister and evil as ever, has entered the race, to which Marshall and his group of friends have devised a plan to take down Dino and expose his criminal activities and what really happened that day he killed Marshall’s friend. Waugh is spectacular here, as he allows his camera to show the action fluidly without any quick cuts. Paul is fantastic as always here, as we see his struggle to get his revenge, but allow his good side to not take things too far. Poots is as always a pleasure to see on screen, and she adds a bit of badass to her character and is never the “damsel in distress”, which is great. And Keaton does a bang-up job as the mysterious Monarch, giving a colorful commentary on the race. ‘Need For Speed‘ is a lot of fun, and is definitely the best video game adapted movie to come out yet, and is one hell of a car movie for people who love cars of all models and styles. If you are looking for a great time at the theater, then check this highly entertaining movie out. Fernando’s ‘Need For Speed’ Review!! 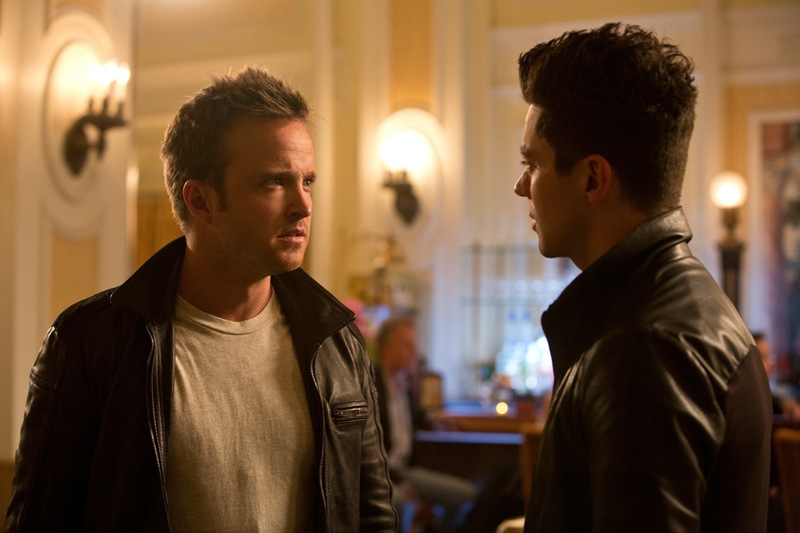 ‘Breaking Bad’s Aaron Paul Has The ‘Need For Speed’!!! This entry was posted on Thursday, March 13th, 2014 at 11:59 am	and is filed under Film, News. You can follow any responses to this entry through the RSS 2.0 feed. You can skip to the end and leave a response. Pinging is currently not allowed. « Fernando’s ‘Need For Speed’ Review! !